Some definitions of architecture obscure more than they help. For example, Nikolaus Pevsner’s claim that “architecture” be reserved for buildings “designed with a view to aesthetic appeal” leads us away from the building to the designer’s intentions. It doesn’t give us much to work with. Pevsner went on to give what’s now a well-known example: a “bicycle shed is a building; Lincoln Cathedral is a piece of architecture” (1948, p.xix) but this too is not very useful, especially for looking at educational buildings. Lots of schools look like big bike sheds. Methodologically, some way of referring to all schools and their architecture would help. It belongs to Giancarlo De Carlo, architect of many schools and universities from the early 1950s until 2005, a member of Team 10 and – though somewhat out of the architectural mainstream – ultimately a recipient of one of the establishment’s highest awards, the RIBA Royal Gold Medal. I’m interested in what this definition can do methodologically for the researcher of schools. I think it’s useful. It provides ways to think seriously and helpfully about space (who organizes it? how? etc) rather than get distracted by “architecture” and whether or not a building is intended to be attractive. It’s tightly delimited as concepts go but that precision gives something solid to think with and think against. It also raises lots of questions. What needs to be the case in order for this definition to be true? What are the consequences, what must follow from this? What is missing? 2. “Who organizes space?” becomes key. Organization does not just happen. It has an organizer. Often a space-organizer is not an official Architect: “The most important thing is that structure and form leave the greatest space for future evolution, because the real and most important designer of the school should be the collectivity which uses it.” (De Carlo 1969 p.32). See also Jeremy Till’s discussion of “slack space” i.e. that kind of design which “asks eventually who the designer of space is…” (2009, p.134) and Elizabeth Shove et al.’s proposal to see “users and consumers as designers in their own right” (2007, p.10) – all ways of overcoming a static, imposed function and extending the potentials of what buildings and things are and could become. The advantages of thinking in terms of architecture as space-organizing (rather than aesthetics, say) become clearer now – space is the thing and (albeit within limits) something we all participate in arranging whether teachers moving desks or students moving themselves and each other – see this excellent post by Siobahn Dytham. Professional architecture (i.e. Architecture) still needs defining but not on the basis of space which we can retain as a category common to all actors’ thinking and doing (even if they think and do with it in different ways – see 3, 4 and 5). 3. If everyone organizes space, how do spatial organizations – architectures – differ? If official architects i.e. Architects have no monopoly control over architecture because spatial organization is something that everyone does, it nevertheless helps to distinguish architectures. I suggest there are 4 main ways to see these differences: (i) by the time of organization (see 4, below); (ii) by the particular resources used to organize space i.e. what teachers use to organize space is not the same as what Architects use (see 5); (iii) by a person’s intentions for organizing space. For example, both teachers and architects organize space but a teacher is interested in space-organizing as a means to teach better (an instrumental motivation). For an Architect, space-organizing is intrinsic to their work (not a means to something else); and (iv) in the institutionalization of Architects as distinct from other space-organizers/architects. To paraphrase John Searle, part of being an Architect is being thought to be an Architect (1995, p.34). 4. When is space organized? (Time as event). Timing is fundamental – when one spatial organization happens in relation to another. For example, students’ space-organizing happens after and so in Architects’ space-organizing. Who gets to go first at organizing space frames the opportunities and constraints for those that follow. That said, there is no “first”: any architecture of the present moment is always dealing with spatial organizations of times past. De Carlo explores this in a very short, Open Access essay Reading and Tentative Design (pdf). 5. What space-organizing resources organize physical space? Architects organize space with walls, storeys, doors, stairs, windows, colour, light etc, the form of these things and how these things (and groups of things) are oriented in spatial (and so to some extent also temporal) relation to each other . Teachers use posters, tables, chairs, bodies etc and how these are oriented (e.g. through seating plans) as well as non-objects e.g. names of rooms or zones, gestures, gaze, voice. Students are likely to have only these last three and their bodies. Hence, from Architect to teacher to student, these resources are all viable means of organizing space but their nature changes; there is a shift towards greater reliance on social rather than material aspects of being and towards less tangible kinds of thing that are less durable and (seemingly) easier and cheaper to change. This bears on how certain actions and values come to be promoted and enshrined through more material means (see 6) and also risks the ignoring of organizations of physical space that rely more heavily on social production and so tend to be less visible. Finally, it matters not just which space-organizing resources people have, but their real capacity to employ these resources and (where resources rely on social meanings) their capacity to understand the meanings for the particular community in which they are relevant and meaningful. 6. What is the duration of organization? Time as process – the ongoing-ness of architecture: The word “organization” has a vestigial verbiness, a sense that organizing is ongoing. It is, in fact, a deverbal noun, a special type of noun of process. Similarly, Herman Hertzberger refers to architecture as The Ordering of Space, not The Order... Being organized, space has, in turn, an organizing influence albeit not in a simple, deterministic manner. This too is ongoing (given the relative durability of buildings) and so one of architecture’s key contributions to (mass) education, facilitating stability, relative predictability, social reproduction, continuity (and a sense of home perhaps because of this) but also a sense of a dynamic potential, a progression of sorts even if this is ambiguous. Movement towards a future but where the building seems to stay still (even while it is at work) and cohorts of students move through it. 8. Physical space ≠ social space ≠ what people actually do. There is no presumption that physical space maps directly onto (nor produces) social space nor that people will simply act out what the building expects of them. This is a definition that avoids determinism and closed causal models. Architecture makes potentialities, not actualities. What’s Missing from the Definition? 1. Amount of space available. How much space there is affects how it can be organized. Obvious perhaps, but a fact almost always missing from discussions about classrooms and learning spaces. Without it, however, it is not possible to know whether the benefits and challenges of a particular design arise from the amount of space being available (in turn extending teachers’ and students’ possibilities for action), the particular spatial organization involved, or a combination of both. Andrew Saint (1987 p.211) explained the poor reception of open-plan in 1960s England on architects adopting the form but not size of the American examples that inspired them. Additionally, the amount of space matters in a brute sense. Other things being equal, I have a broader repertoire of actions when given more space. Unsurprisingly, this approach to flexibility is often ignored altogether in favour of architectural interpretations of flexibility or expecting people to do more / be more flexible. Finally, school size matters for a range of educational outcomes: Leithwood and Jantzi’s (2009) review of school effect sizes acknowledges that teasing out the interacting effects is awkward to say the least. Nevertheless, on the basis of their review of available studies, they suggest limiting primary schools to 300 students (if serving diverse and economically disadvantaged populations) or to 500 students (diverse or disadvantaged populations). High schools should be capped at 600 (diverse and/or disadvantaged populations) or 1,000 (similar economic and social groups or advantaged populations). Local context needs to be considered, and whose notion of best educational outcomes debated but, at the very least, the analysis should prompt discussion about how big we build our schools. 2. Aesthetics. Aesthetics is important intrinsically as part of what makes it pleasant and interesting to be somewhere. Beauty motivated De Carlo even if it doesn’t feature in this definition. Aesthetic considerations are also important instrumentally – who gets a beautiful school and who an ugly one can become a highly political question and tool. Governments know this and have used style and image of new school buildings to smooth the introduction of contentious new education policies – the Academies programme in England, for example. And design can be used consciously to market schools and promote competition between them. “I’m looking for an architecture that might involve everyone because architecture is itself already involved with everything … This architecture I’m seeking then is one that everybody, in their own way, can understand and use so that architecture can return to being the first material reference point in what it means to be human in physical and social space. This is an architecture that can’t be ignored. Every one of us ends up planning, designing. We are obliged to plan and design” (De Carlo and Bunčuga 2014, p.252). Images (roof garden, stairs and stairwell) of Istituto Tecnico C. Cattaneo, a high school designed by Giancarlo De Carlo, San Miniato. May 2018. I’m not a great photographer, sorry. However, I do hope the photos give some idea of how – for a fairly standard school building – De Carlo has made quite a few attempts at breaking open that standardness by making connections between spaces, by providing social and spatial opportunities, by being able to see out of and beyond the school. This is a recurring definition across many of De Carlo’s writings. The quotation here is from De Carlo, Giancarlo & Bunčuga, Franco (2014) Conversazioni su Architettura e Libertà. [Conversations about Architecture and Freedom] Milano: Elèuthera, p.125, an excellent book of interviews with De Carlo by his ex-student Franco Bunčuga (I wrote a little about it here with links to other writings by and on De Carlo.) The quote is my translation from Italian (as are the other quotations from that book that I use on this page): “L’architettura è – e non può essere altro che – organizzazione e forma dello spazio fisico”. This article by John McKean about the Faculty of Education in Urbino (designed by De Carlo) provides an excellent introduction to De Carlo and is open access (link is to pdf). “I’m looking for an architecture that might involve everyone because architecture is itself already involved with everything … This architecture I’m seeking then is one that everybody, in their own way, can understand and use so that architecture can return to being the first material reference point in what it means to be human in physical and social space. This is an architecture that can’t be ignored. Every one of us ends up planning, designing. We are obliged to plan and design” (De Carlo and Bunčuga 2014, p.252). If architecture is no longer the outcome of the sacred architect for De Carlo, because space involves (and is organized by) us all there’s an additional consequence that is important for how architecture is studied. The organizational (rather than aesthetic) emphasis on space-as-architecture together with everyone’s involvement in contributing to that means there is now a sense of architecture as a higher level category for thinking about space, one in which we can better understand people’s spatial organizing contributions in similar terms. We have a different kind of (and a more useful) analytic space. As Charles Taylor puts it, this is part of “try[ing] to develop a language in which we can situate the incommensurable web of concepts”, a move towards gaining a “language in which to talk of the transition” (1971, p.50) albeit not in terms of time (as for Taylor) but transition in and of actors. Everyone is involved in making architecture, yes, but we now have a language and analytical means for understanding what people are doing as space-organizers. This implies the need for a further question: How are these space-organizing resources obtained and employed? The means of financing construction, the environmental lifetime costs of using particular resources, the labour used in putting these to work etc – these all matter. I’ve written about finance and school construction and school architecture in this paper (Open Access). In the same collection is an annotated diagram by the advocacy group, Who Builds Your Architecture? (WBYA? ), exploring the movements of a steel truss for an imagined stadium and the migrant workers who will work it into construction, bringing out many of the issues that are commonly ignored. I’m thinking of Amartya Sen here i.e. freedom as the ‘real opportunity that we have to accomplish what we value’ (original emphasis, 1995, 31) so a changing, context-dependent ability where who we are (or are perceived to be) bears on if and how we can employ resources in ways we want. See Luigi Prestinenza Puglisi’s recent article on De Carlo (Italian) for some of the background on this. Against the prevailing currents of the time, De Carlo fought for an integration of planning and architecture in architectural education and in practice and in theory since he saw them as being different cuts of the same cloth with necessary rather than merely contingent relations. This becomes clearer in the logic for ILAUD (International Laboratory for Architecture and Urban Design), the summer school/international workshop De Carlo founded with MIT and other universities: “ILAUD holds that architecture and city-planning are parts of the same issue – the organization and form of physical space – and that their interdependence is such that any proposed action within one of the parts be accompanied by an awareness of its reciprocal effects in the other.” cited in p.81 Reale, L. (2011) Densità città residenza: Tecniche di densificazione e strategie anti-sprawl. Rome: Gangemi. Bruno Zevi (2000 p.22-29) works up a long but beautifully constructed argument on architecture and/as space, and the relations between architecture and the urban that is similar to De Carlo’s in many ways: “The spatial experience that is particular to architecture extends into the city, streets and squares, into the alleys and parks, the stadia and the gardens, wherever the work of man has delimited “void”, that is, enclosed space. If, inside a building, space is defined by six surfaces (a floor, a ceiling and four walls), it does not follow that a void enclosed by only five such as a courtyard or square cannot also be space” (p.29). Zevi goes on to admit he’s unsure whether driving across miles of uninhabited, flat highway would count as an architectural experience but I like the fact he even raises the possibility. “For him [Ernesto Rogers], architecture was about designing beautiful and useful objects but for me it was designing meaningful, suggestive spatial events that might be able to express something of the time we live in and help make that time better. And beauty then? Beauty’s the aim, but what matters is the process that produces it” (De Carlo and Bunčuga 2014, p.108). Pevsner, N. (1948) An Outline of European Architecture. London: Penguin. All other references are linked in text. 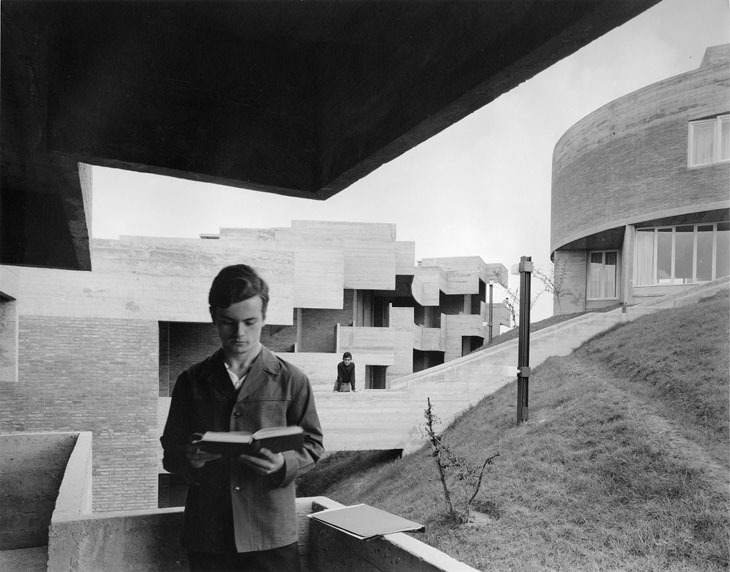 The main image is of the university halls of residence, Collegio del Colle, in Urbino, Italy designed De Carlo. Photograph by Cesare Colombo.